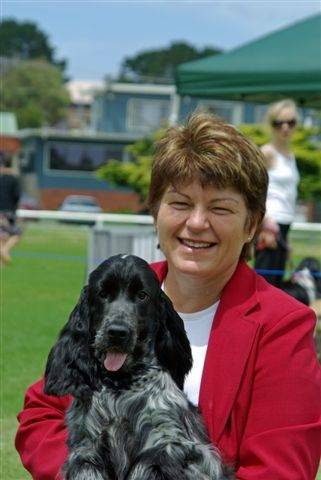 My name is Sue McFadden and I live at Kenthurst with my son Peter and partner John and a small tribe of Cocker Spaniels. Kenthurst is in the Hills District of Sydney New South Wales. I inherited my interest in dogs from my parents Don and Margaret Bovis who exhibited Labrador Retrievers under the Hillburne prefix in Sydney from 1971 until they retired to Pottsville on the Gold Coast. They stopped showing and breeding about 5 years ago. Our lines were based on the famous Lindhills Kennels, Ponsyne Kennels and probably the best known lines of today Guy Spagnolo's Driftway Kennels. My father bred and exhibited his prize winning Kelpies from 1941 under the Hillstone prefix. Dad always encouraged me and always made sure I had a dog to exhibit. My biggest winning dog was Ch Hillburne Golden Boy who took many Best in Group and in show awards. You must understand that in those days, every show had entries of over 100 Labradors and judging would take most of the day. .
As I got older, I began to realise that the glamorous Cocker Spaniel more that often was the Gundog winner, usually Ch Brightleaf Bewinged who was bred by Mac Formston and handled by Barbara Killworth. In 1982, I met Frank Werner of Glenbriar fame. I purchased my first Cocker Spaniel off him Ch Glenbriar Willowmist. 'Tinker' produced my first two champions Ch Briarcrest Miss Daisy and Ch Briarcrest Bramble. Frank and I became wonderful friends and then partners In Glenbriar until his tragic death in 1996. This set me back and I placed many of our beloved dogs in pet homes and with the assistance of great friends continued to exhibit and breed. My greatest memories include watching Frank win Best in Show with Ch Marsden Time Traveller at Canberra Royal in 1985, winning my first specialty with Ch Briarcrest Miss Daisy, 3 Nationals with Max, Gd Ch Feenix Fair Star, Veteran with him 2006 and getting a standing ovation, Best in Show with Pippa, Ch Glenbriar Total Twist surrounded by some of the biggest winning dogs of the year, and Max's boy Grand Ch Cleemist Mad Max winning his first specialty and Best in Group at Canberra Royal. I am sure there are many more. My current young show team give me so much pleasure. We have recently purchased a business That Pet Place at Dural (behind McDonalds). We do not sell animals - only food and accessories and we have now introduced dog grooming. We realise that it doesn't matter who you are, when you ask someone about their dog, their eyes light up and they can talk forever. Dogs make us all equal.